Langtang village and Gosaikund trekking has been inside of the Langtang National park. Langtang, a Himalayan valley, is inhabited by Tamnag and Tibetan (Bhote) peoples and provides a glimpse of mountain life. Gosaikunda is the site of several sacred lakes that area is uninhabited for the most part, but every August as many as 50,000 pilgrims crowded into the area for a festival by lake that figures prominently in Hindu mythology. Langtang Gosaikunda trekking starting from Syabrubesi climb to Langtang valley decent to Pairo (landslide), continues ascend to Gosaikunda. The famous lake of Gosaikunda lies in the Langtang National park. Gosaikunda is the site of several sacred lakes lying south of the major ridge between Helambu and the Trisuli river to the west. The area is uninhabited; however, every August thousands of pilgrims visit Gosaikunda to pay their homage to Lord Shiva. The beautiful terraced landscapes and the rustic villages allure many tourists in Langtang Gosaikunda trek. Explore Trailside wilderness, near Ghora Tabela and Kyanjin hill top view point (Kyanjin), and cultural heritage sites Gosaikunda, notably in Langtang Gosaikunda are trekking. The trekkers crossing the Lauribina Pass (4681m) return to Kathmandu via the Helambu are one extra itinerary. Our itinerary is starting from Syabru Besi and end in Dhunche then drive back to Kathmandu. If giving itinerary is not moot as your plan let us know we redesign another itinerary for you. As we all know a powerful earthquake 7.8 magnitude shook Nepal on the 25th of April 2015 causing many human casualties and destroying Langtang and Helambu areas. So that we heartily request to visit on that area, when you buy the foods and accommodation the local victim people can take a benefit from you that means indirectly you help for earthquake victim people. Trip Duration: 10 nights / 11 days. Walking Hour: 4/7 hrs every day. Day 01: Drive Kathmandu to Syabrubesi (1450m) – 6-8 hours drive by Jeep/Bus, overnight at Hotel (B/L/D). Day 02: Trek from Syabrubesi to Lama Hotel (2480m) – approx. 6 to 7 hours trek, overnight at Guest House (B/L/D). Day 03: Lama Hotel to Langtang village (3541m) – approx. 5 to 6 hours trek, overnight at Guest House (B/L/D). Day 04: Langtang to Kyanjin Gompa (3900m) – approx. 3 hours trek, overnight at Guest House (B/L/D). Day 05: Day hiking and back to Kyanjin Gompa, overnight at Guest House (B/L/D). Day 06: Trek to Lama Hotel (2784m), 5-6 hours, overnight at Guest house (B/L/D). Day 07: Thulo Syabru 2100m 4-5 hours, overnight at Guest house (B/L/D). Day 08: SingGomba 3330m 4-5 hours, overnight at Guest house (B/L/D). Day 09: Gosaikunda 4180m 5-6 hours, overnight at Guest house (B/L/D). 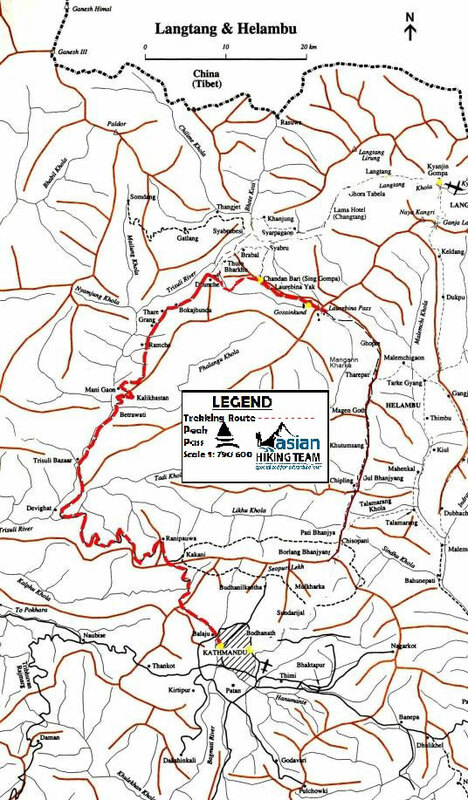 Day 10: Trek to Dhunche 1950m 6-7 hours, overnight at Guest house (B/L/D). Kathmandu to Shyabru Besi and Dunche to Kathmandu by Jeep. Langtang National Park fees - permits, fees. Cargos fees, load up load fees. Asian Hiking Team staffs come to your hotel than we start to drive Shyabrubesi.. We pass through the town of Kakani where there are great views of the Himalayas. For part of the way the road clings to the edge of a steep mountain. After reaching Dhunche, there is a police check post where we must show our entry permit for the Langtang National Park, which you’ll be trekking through. There are excellent views of Gheng (6581m) and Langtang Lirung (7246m) to the north and Ganesh (7460m) to the west from Dhunche. Traversing up and down after crossing a suspension bridge over the Langtang River than we reach Syabru Besi, overnight at hotel. Today our trail continues down the ridge until we come to the east that drops sharply off the ridge and through a dense forest. Trail starts meandering through the chilly deciduous forests of oak and maple that cover the lower sections of the valley and climbs through massive stands of spruce, fir and blue pine. Towering walls close in and our paths will skirt precipitous drops, which fall into a silt-laden river below. Cross a bridge (1960m) over a tributary of the Langtang Khola and then climbs up from the river and in an hour, shortly after the trail levels off, we join the old Langtang trail from Sherpa Gaon and Syabrubesi. Another hour from this trail junction brings us to the Lama Hotel in the tiny village of Chon gtang, overnight at Guest house. We start getting the first tantalizing glimpses of snow-capped peaks. From the Lama Hotel the trail climbs steadily to Ghora Tabela with glimpses of Langtang Lirung (7246m) through the trees. At Ghora Tabela the trail leaves the forest and a spectacular view of Langtang Lirung appears. Continuing up the valley, leaving the forests behind, the trail ascends steadily up to Langtang village, passing below a monastery about 30 min beforehand. Langtang is an interesting Tibetan-style village with stone- walls enclosing houses and fields, overnight at Guest house. After breakfast, we start trekking to Kyanjing, the trail ascends gradually to a chorten behind which is a very long Mani wall. The trail passes two small villages and the village widens. We cross some streams and a moraine before arriving at Kyanjin Gompa. Between Langtang and Kyanjin Gompa, the views just get better and better where we’ll see Yansa Tsenji (6580m) and Kim shun (6750m) to the north and the Langtang Himal to the northwest, overnight at Guest house. After breakfast we start to climb Tserko Ri, the trail further up the valley past the airstrip will provide more spectacular views that include Langtang Lirung (7246m), Ganchenpo (6400m), Langshisa Ri (6320m), Dorje Lakpa (6700m), Lenpo Gang (7100m), and Urkinmang (6170m). We should be able to climb this peak and return to Kyanjin Gompa in 1 long day. The reward for climbing to the prayer flags on its summit is a magnificent view of the 7246m Langtang Lirung, the mountain that dominates the valley. Several of the more moderate local peaks are quite climbable and provide breathtaking panoramic views of mountains in Tibet, including the 8027m Shisapangma, overnight in Kyanjing at guest house. Day 06: Kyanjin Gompa- Lama Hotel 5-6 hours, overnight at Guest House (B/L/D). Day 07: Lama Hotel - Thulo Syabru: 5-6 hours, overnight at Guest House (B/L/D). After breakfast start trekking to Ramche and trail decent to river, cross the river and ascend to Thulo Syabru. You will see the fascinating view of Langtang Himal and more. On the way of your trek you will pass through pine and Junieerps forests. Overnight in Thulo Syabru( 2,230m/ 7,316ft). Day 08; Thulo Syabru to Shing gomba: 3-5 hours, overnight at Guest House (B/L/D). You take the broad trail climbing up to Dimsa village and the trial continues less steeply, through rhododendron, hemlock and Oak forests to Shin gomba. On the way of your trek you will see fantastic views of Langtang Himala and langtang valley. Shin gomba is another popular place for Cheese. Overnight in Shin gomba lodge (3,330m/10,925ft). Day 09: Shing gomba to Gosainkunda, 5-6 hours, overnight at Guest House (B/L/D). The trail ascends smoothly through rhododendron covered point to the top of the rim and through a forested area. The area in-between Shing gomba and Laurebina Yak is a sanctuary for the red panda, an endangered species that the Nepalese call cat bear. You return to the ridge path and climb a wider route through alpine country to arrive at a Gosainkunda. Explore around the Lakes and overnight in Gosainkund (4,180m/14,632ft). Day 10: Gosainkunda to Dhunche 1950m 6-7 hours, overnight at Guest House (B/L/D). Today is a bit long day; the trail is coming down following the day 09 and steeply down crossing pine, rhododendron trees. Finally you will be in Dhunche the district head quarter of Rasuwa distric where government office and offices, monastery, temple and fascinate hotel. Overnight in Hotel. Day 11: Dhunche to Kathmandu, overnight at Hotel (B/L). Early morning we take bus / private jeep/car to Kathmandu 6 / 7 hours drive. We have lunch on the way. Upon your arrive transfer to Hotel, finished trip.